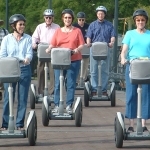 City Segway Tours is happy to welcome you to Atlanta and to everything we have to offer in the heart of the South. he Segway is the first of its kind—a self-balancing, personal transportation device that's designed to operate in any pedestrian environment. It's new, it's cool and a ton of fun!